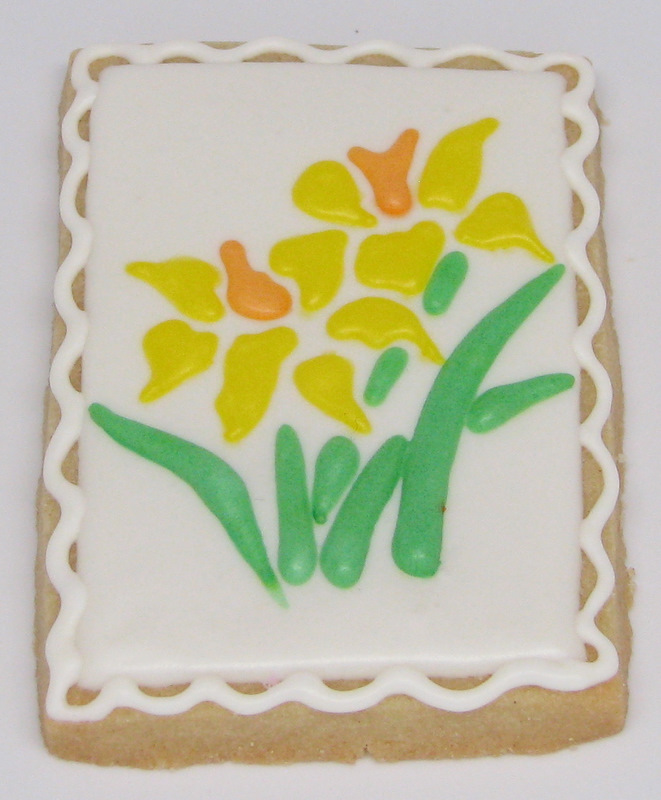 Sometimes I think decorated cookies are so much a part of my kids’ lives that they are no longer impressed and/or interested in them. But every once in a while, they will surprise me. Like the other day when I was at the school volunteering and one of my sixth-grader’s classmates came up to me and said, “Hey, aren’t you Casey’s mom?” I said, “Yes, I am”, to which she replied “Oh, cool! 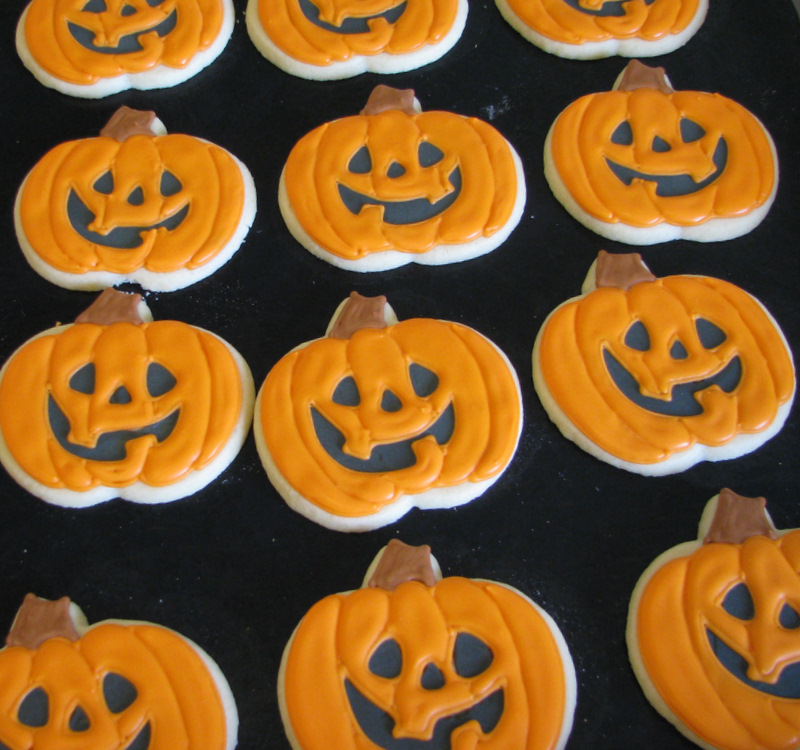 Casey said you’re the best cookie decorator in the WORLD and you’re going to make cookies for the whole sixth grade for Halloween!” Reaaaaallllly…. I did it a little bit differently than she did, so check out her post, too, and choose which way you want to do it. Her way is a little bit neater, but I think my way is a teensy bit faster, which is what I was aiming for for this project. Here’s how I did it. 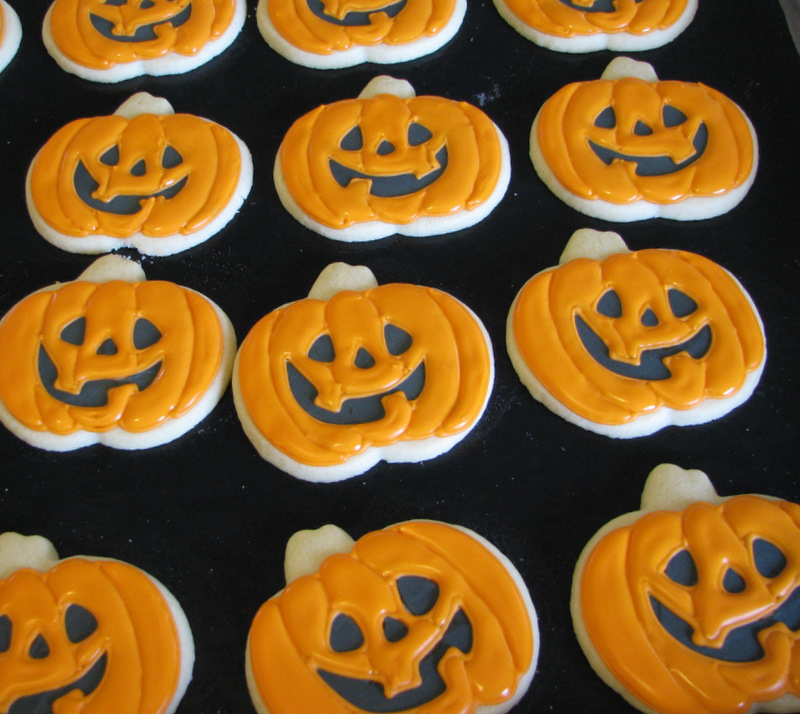 First bake a ton of pumpkin cookies. 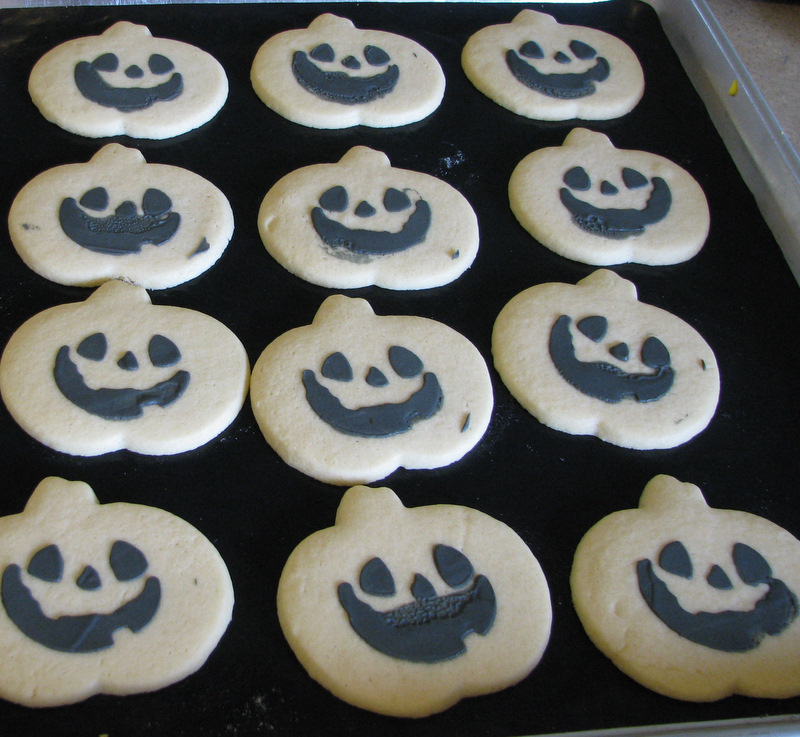 I used the basic pumpkin cutter that comes in a lot of Wilton sets. This one happened to be from the Spooky Shapes set, but it is also in several other sets. 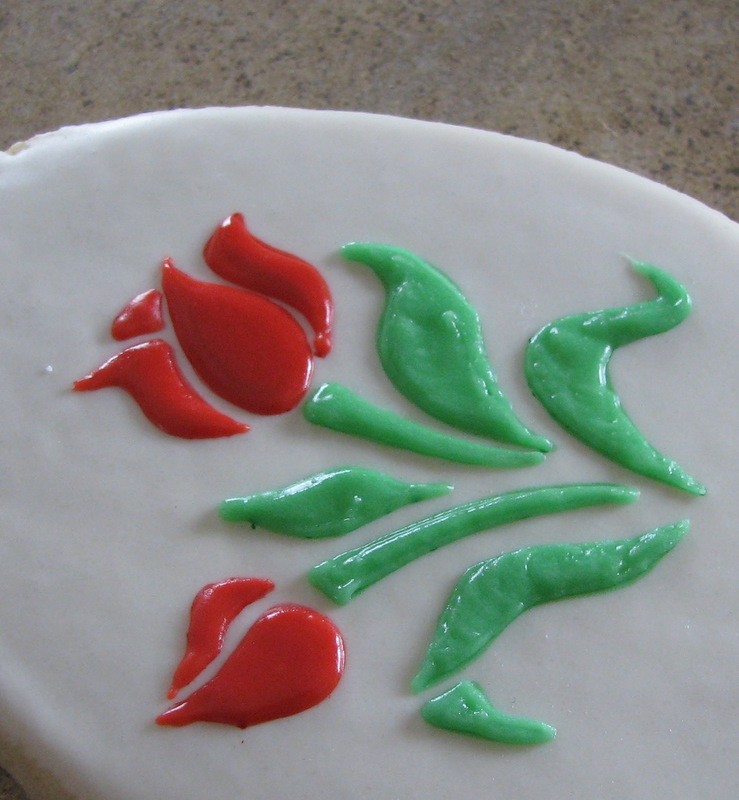 To stencil, I use an offset spatula, and squeeze a little frosting onto it. 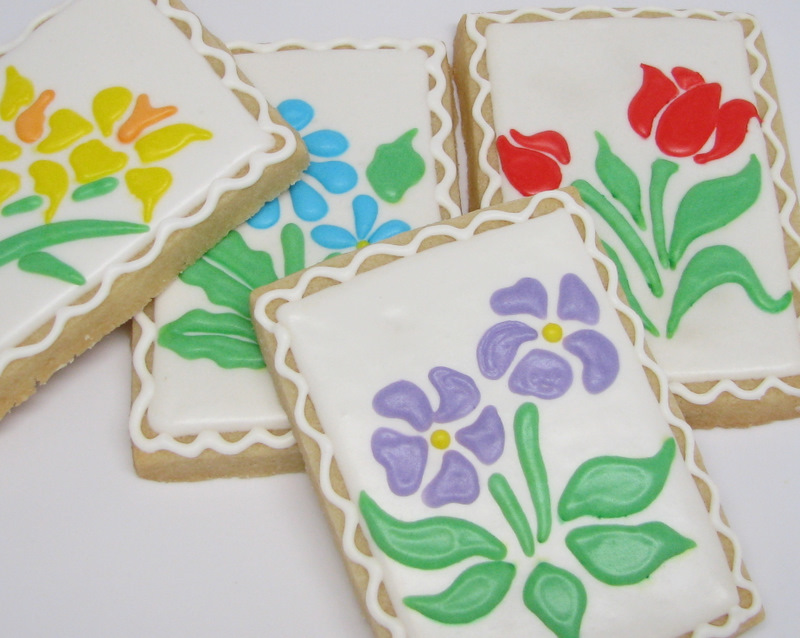 I’m using Royal Icing here, which is unusual for me. But Meringue Powder Buttercream would also work. 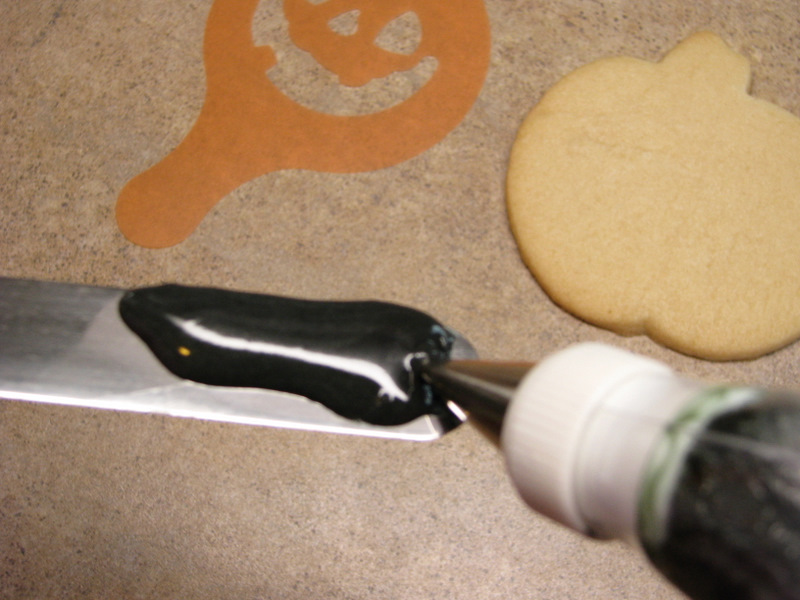 Then anchor the stencil to the cookie using two fingers, and swipe the frosting-ed spatula over the stencil. Then carefully lift off the stencil. Ok, now if you want your stencils to look nice and perfect, you’ll want to wash off the stencil in between each use. But if you’re in a hurry, and it doesn’t really matter how they look, then by all means, continue on without washing. Ha ha… I actually had some friends come over when I was at this point. I just kept praying that they wouldn’t walk into my kitchen. You don’t exactly want anyone to see them when they look like this. I did some in black and some in yellow, and they looked equally horrible. It looks like they have milk mustaches. But the good news is, that it doesn’t matter in the least. Yay! Next, outline in orange. I used a PME 1.5 for outlining. It’s my favorite outliner! Actually on the bottom three, I forgot to switch my tip, and outlined with a 2. Then I remembered and switched it back to the 1.5 for the rest. Can you see the difference? The 1.5 is just a little more defined. I like it better. After outlining, you’ll want to wait a bit and let your outline dry. But if you’re doing a ton of them like I was, by the time you get to the last one, your first ones will be ready to fill in. Fill in every-other section and let it dry for about a half hour. (Or, like the outlining, if you have several dozen to do, by the time you get to the last ones the first ones will be ready.) Doing it this way helps SO MUCH with keeping definition in your design. Best tip EVER. Thanks Sugarbelle! Then fill in the remaining sections. I usually do green stems on my pumpkins, but I had seen some pumpkins done by Laura at A Dozen Eggs that had brown stems, and I loved it! So I had to try that this year. You could add some green vines at this point, but I was in simplify mode, so I left them off. It’s cute either way. 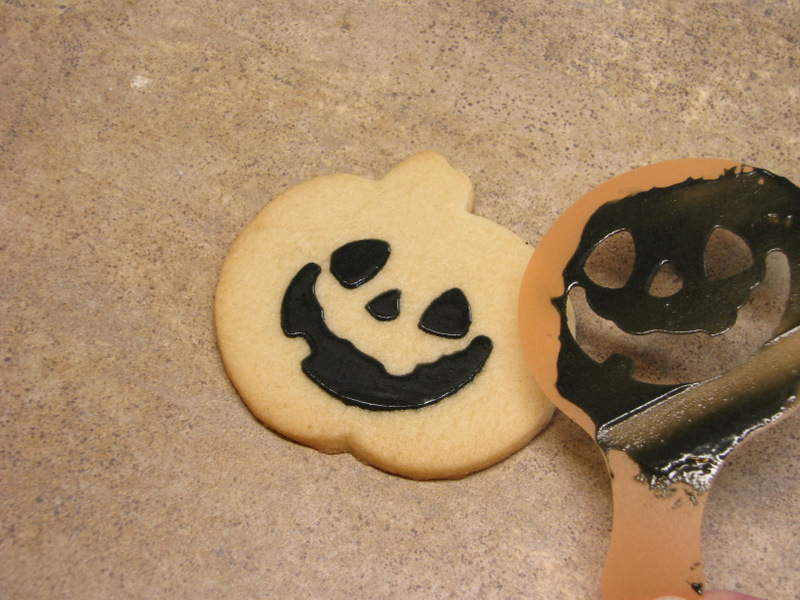 Cute, easy, and you don’t have to have any artistic ability to do these. 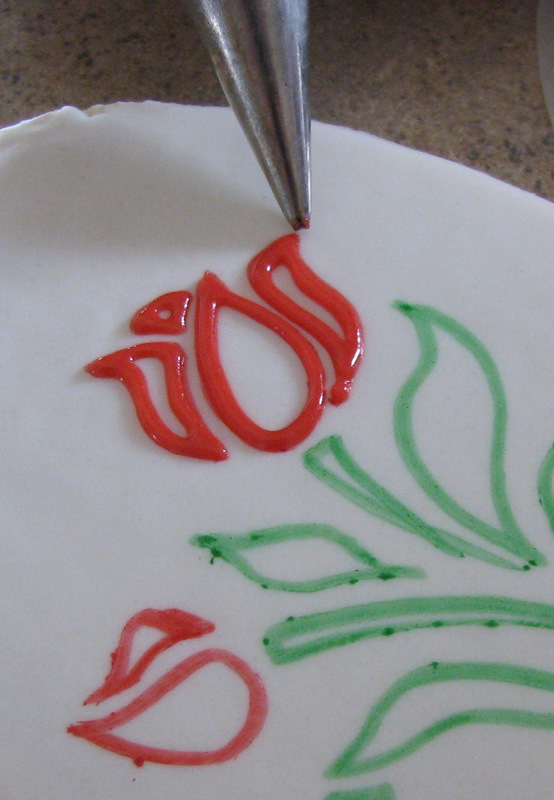 You could try this method with all kinds of stencils. 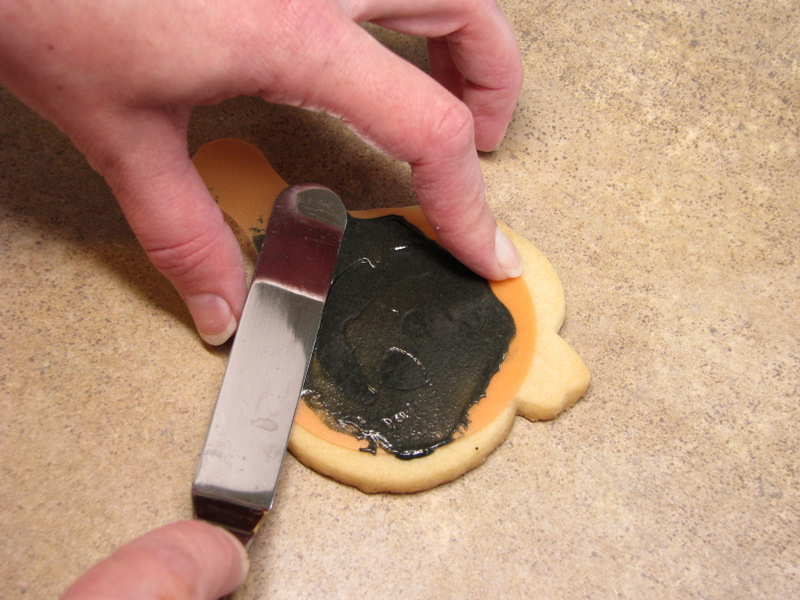 I’m definitely going to keep it in mind for Christmas cookies this year. Give it a try! A couple of months ago, we got a whole bunch of new stencils in our shop. I got to work right away playing around with them (it’s a tough job, but somebody’s gotta do it!) Over the next few weeks, I’ll show you what I learned. I probably shouldn’t start with my favorite– I should probably save it till last– but I can’t help it. I love these. 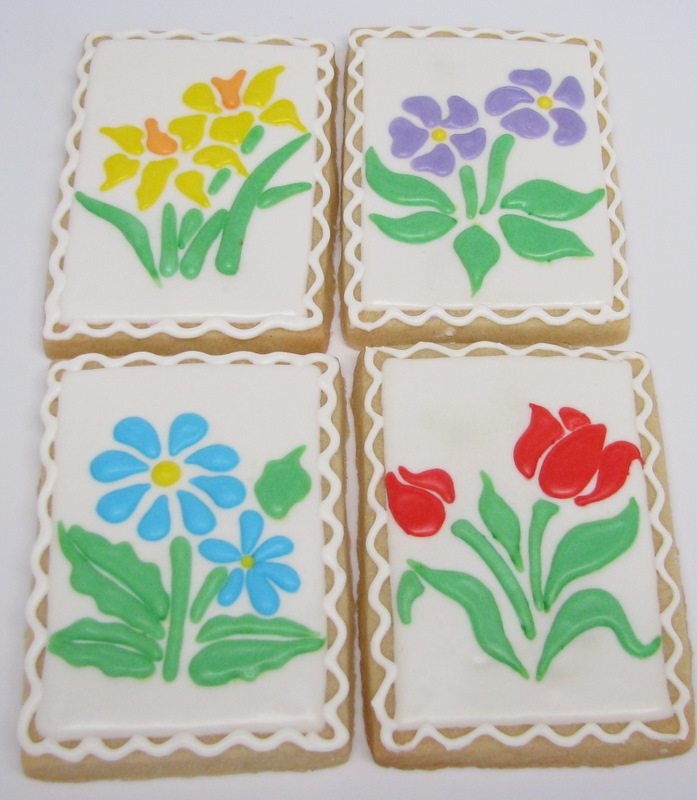 They are done with the Mini Spring Garden stencils. Which really aren’t all that “mini”, by the way. 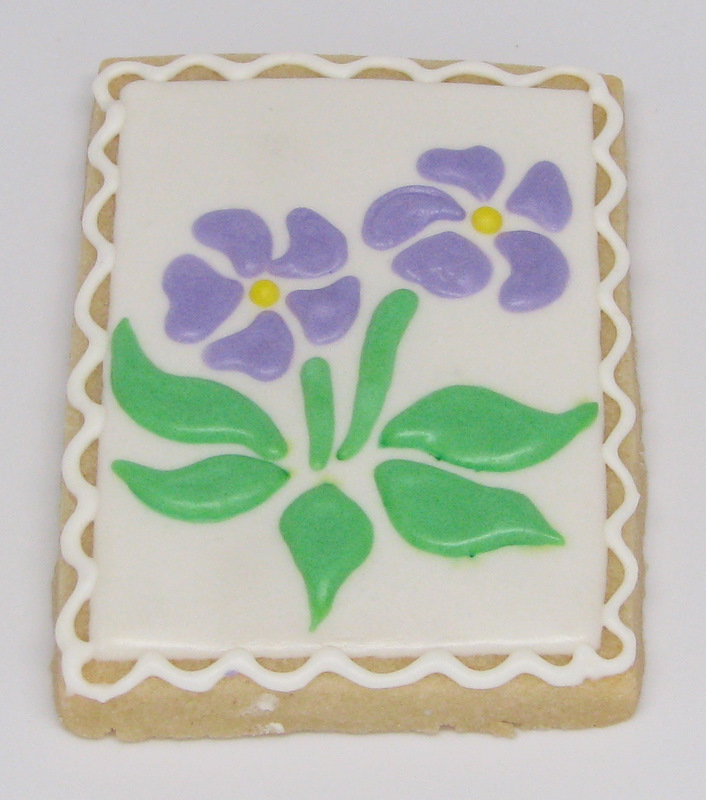 They are made by a company who is used to doing large cake stencils, so they call most of the cookie stencils “mini”. They are a great cookie size. Another way to use stencils is to use them as a template. I really like using them this way because it’s easier to get lots of colors on there. Sometimes it’s pretty tricky to get multiple colors using the traditional stencil method. I made the four rectangle cookies without taking any step-by-step pictures, because I’m forgetful like that. So I had to go back and do the tutorial on an egg cookie that I had sitting around. But you’ll get the idea. 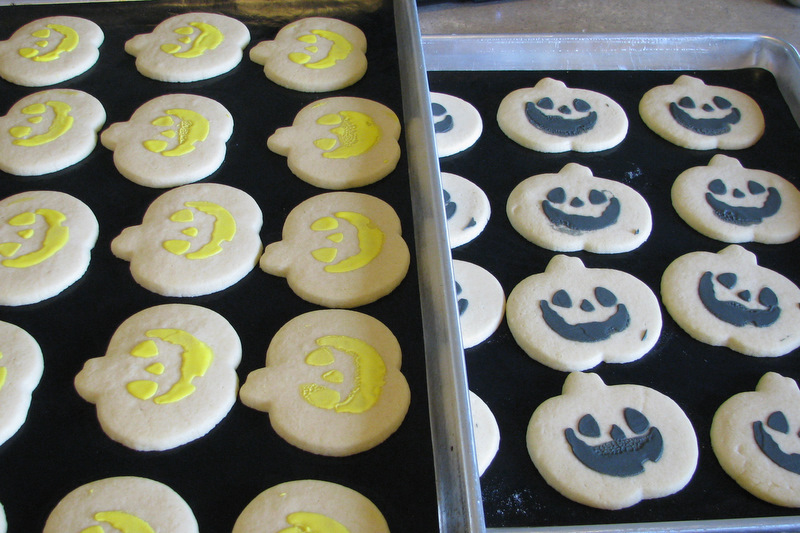 First you’ll need to bake and glaze (or outline and fill in) your cookies. I used the largest rectangle from the rectangle cutter set. Let them dry completely. You’ll need some edible markers. I like the Americolor Gourmet Writer 10-color set. 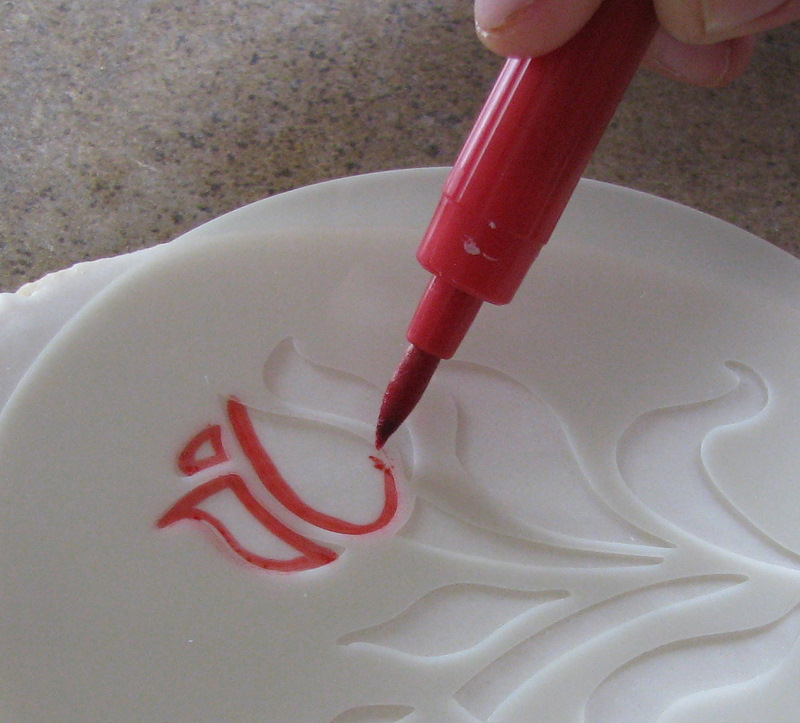 Choose marker colors that match the color of frosting you’re going to use. 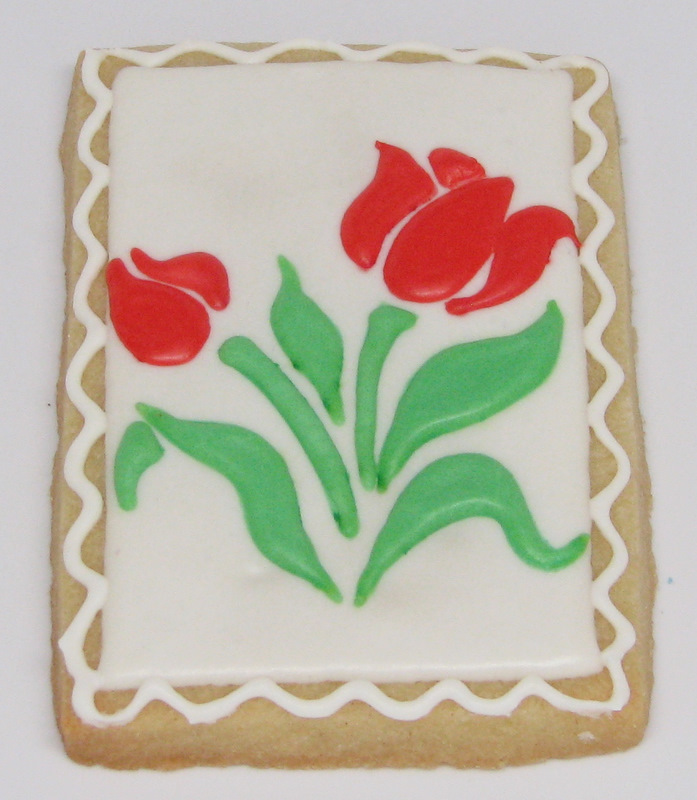 For this one, I was making red tulips with green leaves, so I used the red and green markers. Use the template to outline each section. Finish all of your outlining during this step. Otherwise, you’ll have to wait until the first part dries before you can replace the stencil to outline the next section. 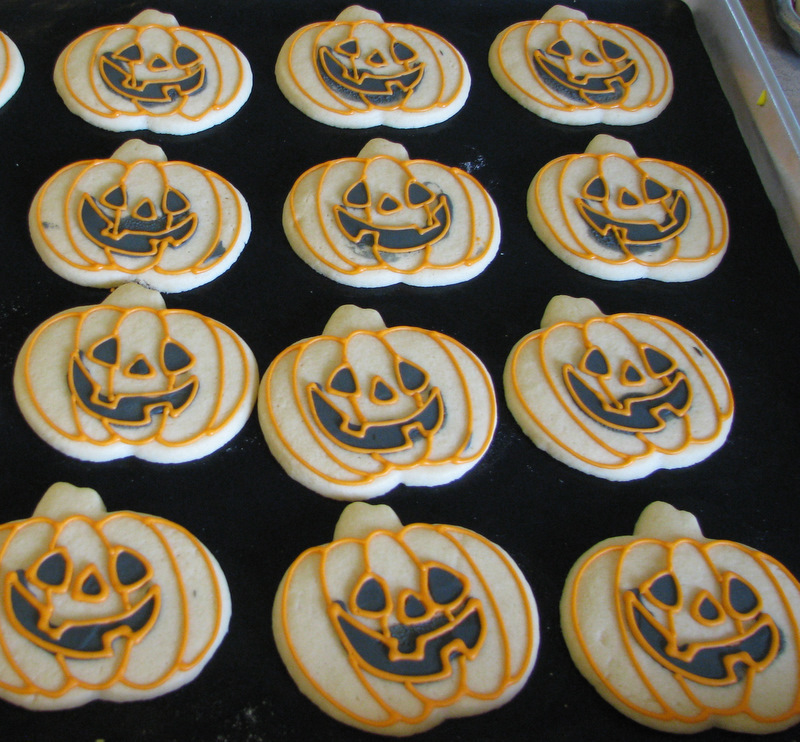 I know that’s just common sense, but I think it bears mentioning since I may or may not have forgotten to do that on one of these cookies. You’ll probably notice that there are some little blotchy spots. Sometimes that happens. Not all the time, but sometimes. Why? I don’t know. But don’t worry about it if it happens to you. You’ll be piping over it anyway. Next, you’ll want to have some runny-consistency frosting. Meringue Powder Buttercream is what I used here (watered down a little bit so that it is pretty soft), but you could also use Royal Icing or Corn Syrup Glaze. Just use what you’re comfortable with. 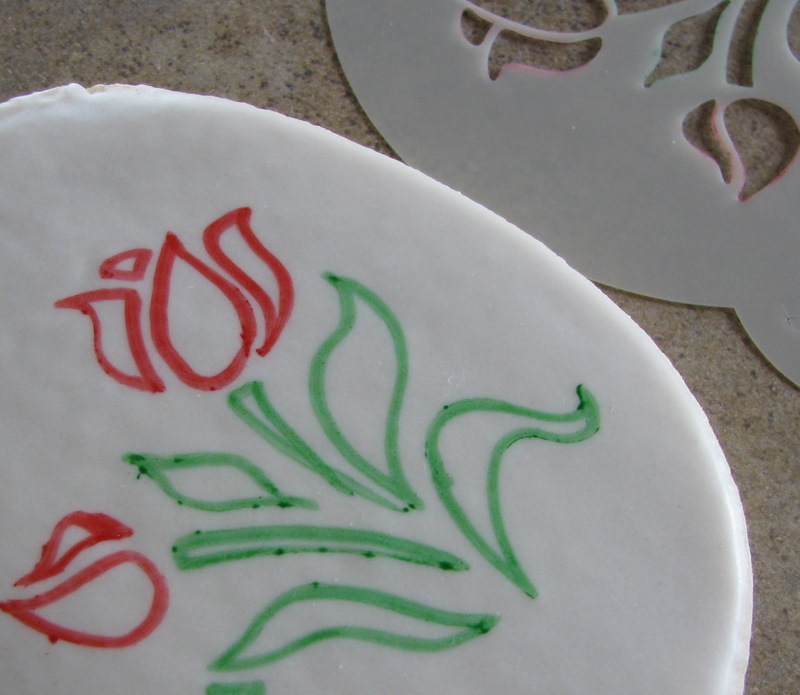 Outline each little section with your frosting using a small tip. I used a #1 here. You’ll want to stay just barely inside your marker guidelines, because when you fill in there will be a tiny bit of spreading. 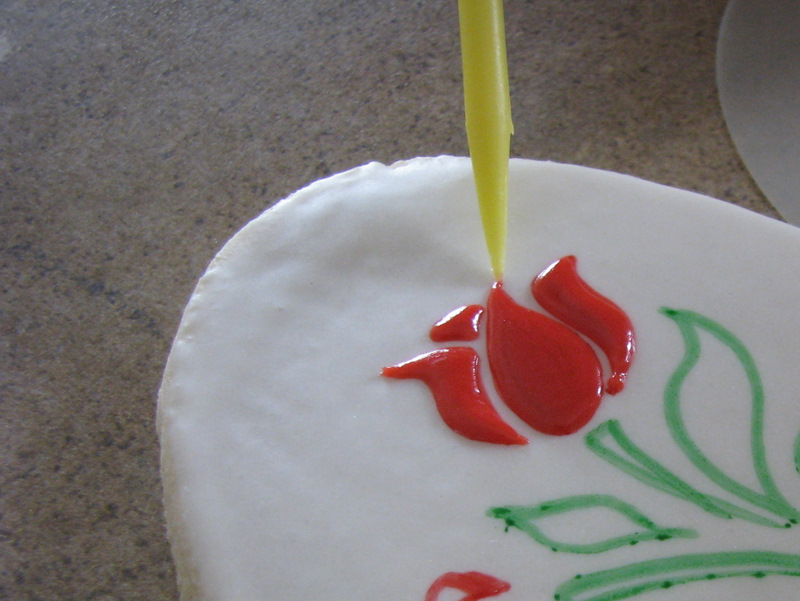 While outlines are still wet, go back and fill in using the same frosting and tip. 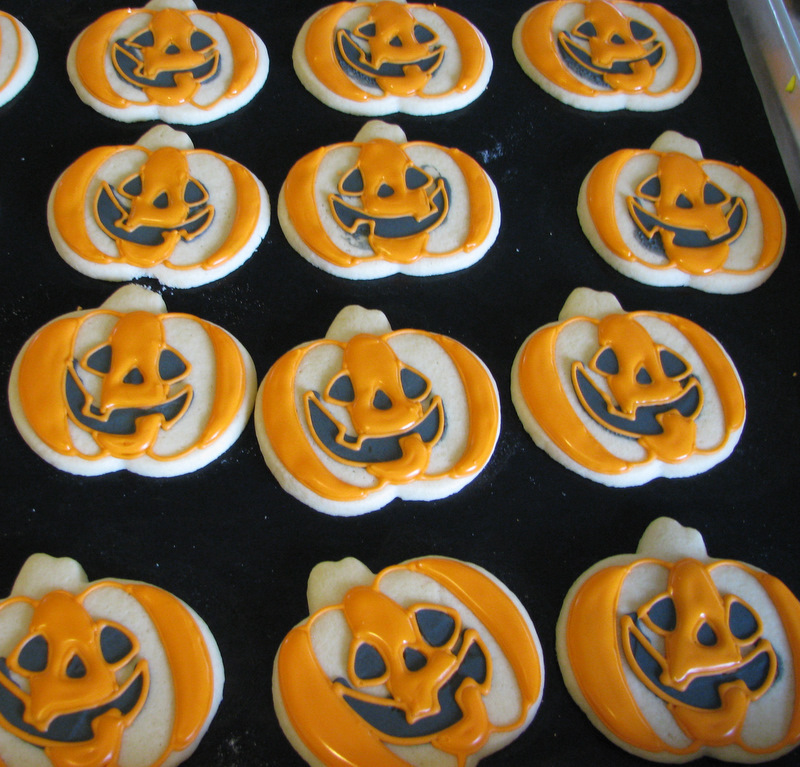 After I fill in, I use a boo-boo stick to even out the frosting and to pull out sharper corners and tips. Continue on with all colors. Try to get your frosting colors the same consistency. 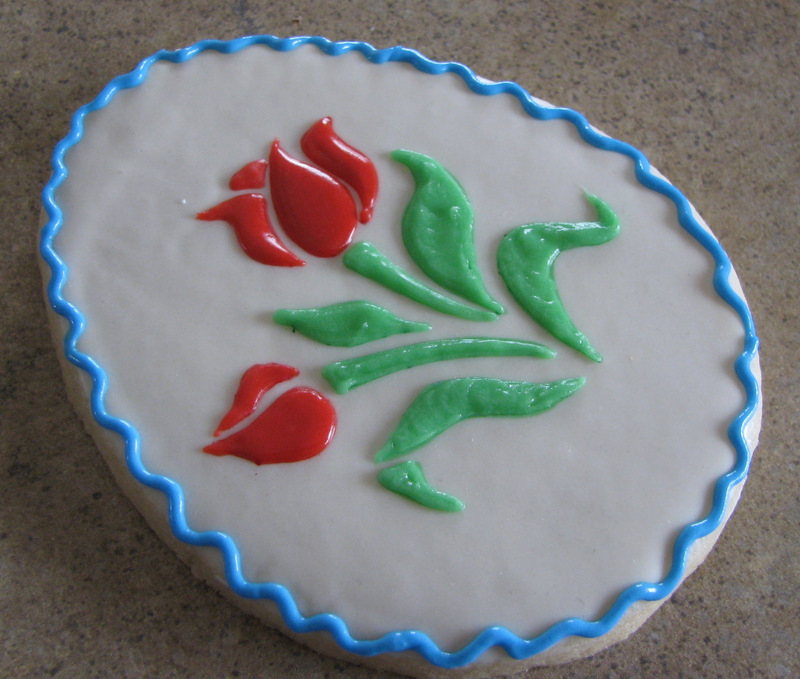 My green was a little bit thicker than my red, which is why the tulips look more smooth than the leaves. But hey, it adds texture. Yeah. That’s it. 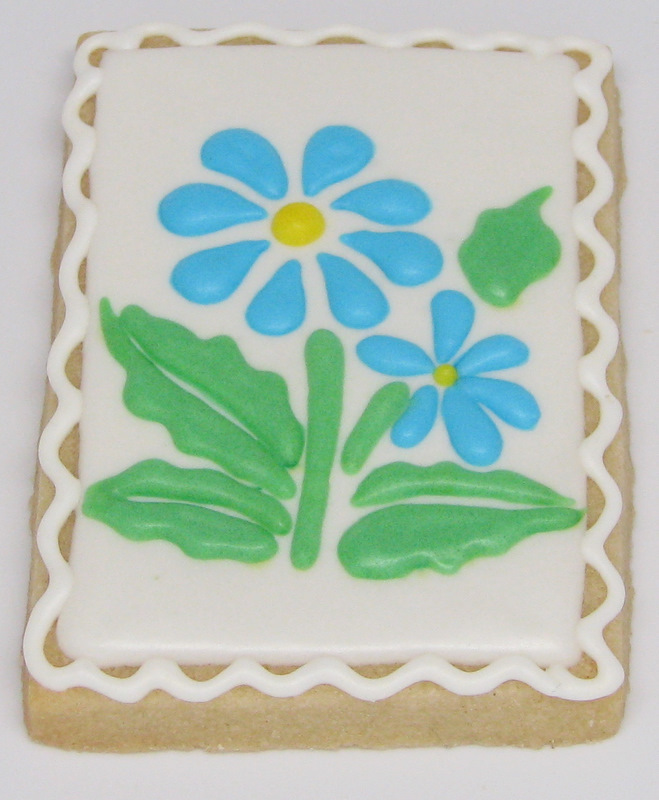 Then you can add a cute border to the cookie. They actually make pretty cute Easter eggs. 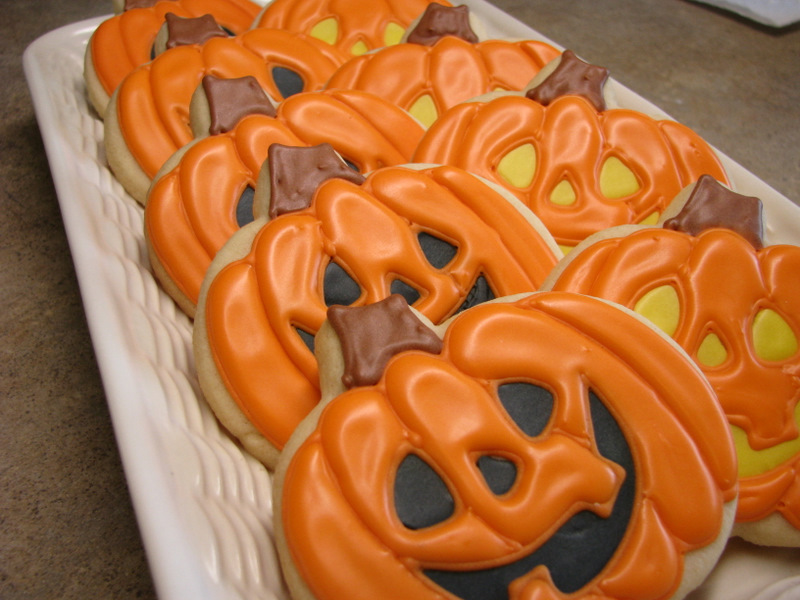 These were really fast and easy, and I loved how they turned out. It makes me think of spring… which is still pretty elusive here in Idaho. To THREE winners. I’m tired of only having one winner. So just comment on this post by midnight on Wednesday, April 20th, and I’ll choose three winners using random.org. Good luck!